make the leap to become a professional player. The book called ‘The Footballer’s Journey’ gives young players, coaches and parents insight into the industry and advice on how to progress their career. Local football enthusiast Dean Caslake has teamed up with Plymouth Argyle defender Guy Branston to write the book which features real life stories from current and former players acrosss different leagues. 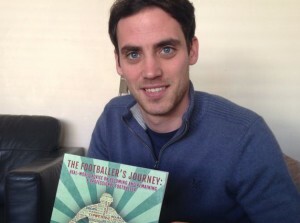 The book will feature on Sky Sports TV show Soccer AM and in the popular football magazine Four Four Two. Dean said, “From a young age like a huge number of lads across the country, I dreamt of becoming a pro footballer. I had a few trials but never any success. Since that point I have wondered what makes the pros you see on the TV different to the vast number who set out with the same dreams. I wanted to explore this unanswered question further and that’s how it all started. Some of the footballers that have contributed include Chris Smalling (Man Utd), Neil Ruddock (former Liverpool player), Steve Claridge (former Birmingham City player), Mike Pollitt (Wigan Athletic) and many more.